News about Sweet Afton's opening spread like wildfire this week, and Meg, Tom and I were right there along for the ride. We paid a visit to this new speakeasy-esque bar on Thursday when it was still in its soft opening--but now, it's officially open. Three words, you gotta go! I call Sweet Afton "speakeasy-esque" because in spite of it being a comfortable, laid-back bar, it's also something very special. The dim lighting, distressed wooden beams, exposed light bulbs and welcoming communal seating, makes you feel like you've entered a new world very much outside of Queens but without pretension. In addition to the cozy indoor seating, which stretches all the way to the back, there's also a quaint outdoor area with about a handful of tables. Although it was still closed when we visited, on a nice night, it'd be a great setting to relax with a spicy margarita or Afton's delectable grub. While the food menu is short, it boats new spins on bar grub such as their signature beer battered fried pickles, Irish sausage rolls, hand cut fries with malt vinegar and a Pat La Frieda burger. What I love about the food selection is that everything is locally supplied and therefore very fresh--same goes for the drinks. Drinks - We started the night with a round of drinks and the variety that we got was great. Meg ordered a wheat beer, that was refreshing and light, Tom got a glass of Malbec and I chose a mixed drink called the Spicy Cherry Margarita, which made quite the impression on me. If you like drinks with personality, this one's for you--the first sip tastes crisp and fruity and immediately after swallowing, the habanero infused tequila warms your throat. It's a wonderful sensation that lingers in your mouth until you stop drinking it, bringing your tastebuds to attention in a good way. 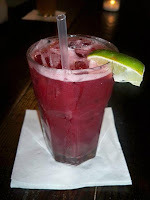 My second drink was Afton's signature Red Lemonade with citrus vodka, simple syrup, lemon and cranberry. It was refreshing too but not as spectacular as my margarita--I think it was a tough act to follow--the overall flavor being sweet and syrupy without much zing. If you like tropical, sugary drinks, you'll enjoy this one. Nibbles - We started with a basket of Irish sausage rolls, wrapped in flaky puff pastry. I loved biting into the buttery pastry dough and then getting to the hearty sausage part that had some spice. It came with a side of vinegary HP sauce, which gave it a kick. 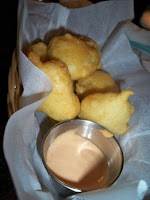 Next came the legendary beer battered fried pickles with smokey mayo sauce. I couldn't imagine what they'd look like, never having tried fried pickles before. They simply blew me away, looking like gorgeous puffy clouds. Once we took a bite, we were hooked. The batter was super light and tasted like the dough of a sweet zeppole, without the powdered sugar of course. The inside, where the pickle lay nestled, was crunchy and juicy, but not soggy. The spicy mayo enhanced this snack further, making the flavors in the pickle really sing, while giving the tongue a slight tickle. 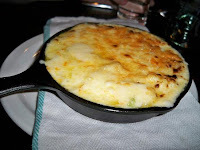 Main Grub - Our main dishes consisted of Afton's signature burger, two ways, and their creamy mac and cheese. Both were outstanding and I especially loved the mac and cheese, which incorporated Irish cheddar, gruyere and muenster cheese. Needless to say, it was as rich as can be, and the best part was the well-done crunchy crust. The burgers were excellent too, and the meat was the piece-de-resistance. You could literally taste the quality when you bit into the soft, juicy medium-rare patty. 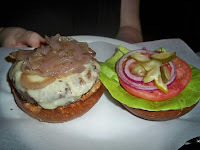 The bun was delicious, airy and slightly sweet, making it the perfect way to sandwich the burgers' yummy contents. I mentioned two varieties of burgers, one of which was topped with thick, double smoked bacon and the other included caramelized onions. I preferred the onions because the bacon was a tad too greasy for me, but for hard-core bacon lovers, it's great. The staff at Sweet Afton is friendly, personal and they have tons of passion for what they do. Owner, Ruairi Curtin's hospitality was second to none, as he sent out his personal food recommendations, which we appreciated. But even before we met Ruairi, our waitress was helpful and nice--and PJ, the chef was wonderful, giving us the inside scoop about local food suppliers they use. Costs are moderate for drinks but inexpensive for food, given the excellent quality of ingredients. Beers: $5-$8; wines: $7-$9/glass, $28-$36/bottle; mixed cocktails $8-$9. Food: burger $8 (+$1 for toppings); mac and cheese $8 (+$1 for bacon); fried pickles $4; Irish sausage rolls $7. I want a sour cherry margarita and that bubbly mac and cheese. Now. I love it. I think the best part is - I saw you in there that day - and thought it'd be exceptionally creepy to scurry up and say, "I'm such a fan"... my hubby and I are moving out of Astoria this week - (to Rhode Island) - but I attribute the past 18-months of GOOD eats to YOU! :) Thank so much!!! That is such a lovely compliment Samantha. You are so welcome and I'm so glad that you've enjoyed the good eats in Astoria. We'll miss you!